It's a tremendous undertaking to buy your first house. But it can also be a bit frightening. If you're like most people, you'll likely need some expert suggestions along the way -- and you'll undoubtedly need an experienced REALTOR® looking out for your highest interests. I'm absolutely qualified to provide assistance with purchasing your first home. From locating the perfect house among all the properties in Kearny, to advising you on closing costs, I'll lead you through every turn of the home-buying process. I'll help you characterize your want list of features that you want in your home, your community, and your school district. I'll walk you through the mind-boggling financial aspects of purchasing a house, including the many mortgages and home buying methods to choose from. You can depend on me to closely watch all the new listings, and make sure I inform you of all the houses that match your criteria. Rest assured that I'll do everything in my power to cut out all the stress that accompanies buying your home. 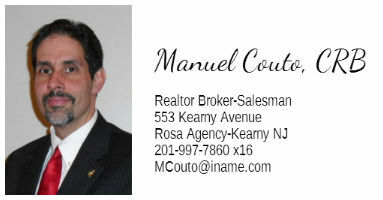 I'm ready to work for you -- finding the perfect home in the Kearny area is my business! Feel free to call me anytime at (201) 997-7860 x116, or click here to leave your info, and I will get back to you right away.